On March 22, 2017, the U.S. Supreme Court, in a 6-2 decision, affirmed the August 2015, ruling by the U.S. Circuit Court of Appeals for the Sixth Circuit in Star Athletica LLC v. Varsity Brands Inc., and affirmed that two-dimensional graphic designs are entitled to copyright protection as “pictorial, graphic, and sculptural works” under the copyright law for useful articles under certain circumstances. This is the first time the U.S. Supreme Court has ruled on copyright protection for apparel. Fashion is part of the creative economy. The fashion and apparel design sector brings together fashion creatives, executives, and entrepreneurs in more than 200 countries. According to industry reports, fashion is a more than $1.2 trillion global business with more than $250 billion spent yearly in the United States. Copyright protection for fashion design has been difficult to obtain and is very limited, mainly due to previous copyright rulings that clothing designs are utilitarian or functional. 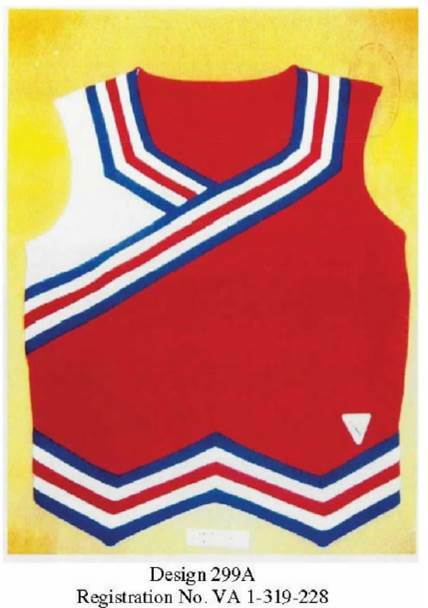 Despite the general reluctance to grant copyright protection to apparel designs, Varsity Brands, Inc., received U.S. copyright registrations for several of its cheerleading uniform designs for “two-dimensional artwork.” The Varsity designs included graphical elements such as stripes, chevrons, zigzags, and colorblocks. Star Athletica also sold cheerleading uniforms. Star Athletica advertised cheerleading uniforms that were similar in appearance to Varsity’s designs, and so Varsity sued for copyright infringement based upon their registered designs. The district court ruled that Varsity’s copyrights of the arrangement of stripes, chevrons, zigzags, and colorblocks of cheerleader uniform designs were invalid because the noted arrangement was not separable from the uniforms. Dissatisfied with the result, Varsity appealed the district court’s judgment to the U.S. Court of Appeals for the Sixth Circuit. On August 19, 2015, Varsity prevailed at the Sixth Circuit. The district court’s judgment was vacated and Varsity won on the issue of whether the designs are copyrightable pictorial, graphic, or sculptural works. On May 2, 2016, the Supreme Court agreed to review the appellate court decision. A feature incorporated into the design of a useful article is eligible for copyright protection only if the feature (1) can be perceived as a two- or three-dimensional work of art separate from the useful article and (2) would qualify as a protectable pictorial, graphic or sculptural work — either on its own or fixed in some other tangible medium of expression — if it were imagined separately from the useful article into which it is incorporated. The Court in reaching its decision rejected several arguments advanced by Star Athletica to invalidate the cheerleader uniform designs of Varsity. As advanced by Star Athletica, the broad definition of “utility” is that the uniform identifies the wearer as a cheerleader or member of cheerleading team. Hence, the feature of the uniform would not be separable from the utilitarian aspect. The Court rejected this line of reasoning stating that “[t]he focus of the separability inquiry is on the extracted feature and not on any aspects of the useful article that remain after the imaginary extraction.” Additionally, the Court rejected Star Athletica’s argument that there must be a nexus of marketability of the pictorial, graphic, or sculptural feature separated from the useful article. Finally, the Court rejected Star Athletica’s argument that copyrightability of pictorial, graphic, or sculptural features must be based on an inquiry of whether the designer’s artistic intent, methods, reasons, and purposes were exercised independently of functional influences. Thus, the designs of Varsity are not capable of existing independently of the utilitarian aspect of being cheerleading uniform. Of note, Justice Breyer points to design patents as providing protection of useful articles. Of note, the majority opinion did not provide much guidance on how to apply the new test. Hence, to present a stronger case of copyright protection for an article of apparel, the copyright owner should clearly identify the pictorial, graphic, or sculptural feature in the work of art, and make sure that the utility function of the clothing (e.g., useful article) can be defined separate and apart from any graphical, pictorial, or structure features. As noted by the majority opinion, the test “does not render the shape, cut, and physical dimensions of the cheerleading uniforms eligible for copyright protection.” Design patents are an important vehicle to protect apparel designs. The dissent mentions several times that design patents could be used to protect apparel designs, instead of copyrights. Nevertheless, selection of design patent protection should be based on dynamics, including strategies to maximize design rights, design prosecution and examination, enforcement, and related factors. In most cases, high-value fashion designs will need a blend of design patent, copyright, and trademark protection to combat fashion piracy. Clients and attorneys will need to carefully consider the best routes for intellectual property protection of each article to determine which is most consistent with the client’s business objectives. Click here to download the opinion in Star Athletica LLC v. Varsity Brands Inc.